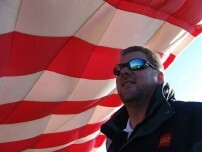 An avid Hot-Air Balloon Pilot, Dan averages between 120 to 190 flights a year. To put this into perspective, an average Hot-Air Balloon Pilot flies 15 to 20 flights per year. Campbell flies 1 to 2 Balloon Races a year. Usually Dan will fly the RE/MAX Hot-Air Balloon or another commercial balloon or a special shape balloon.